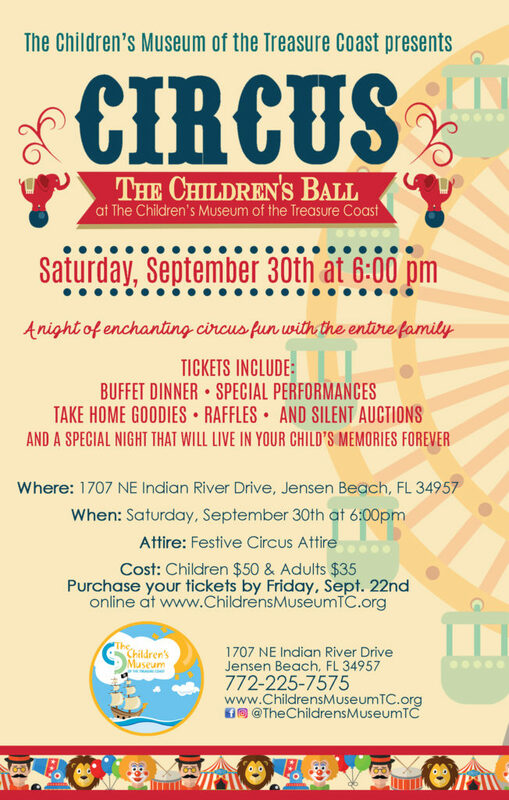 The Children’s Museum of the Treasure Coast is bringing back one of the first events they hosted before opening in 2008: The Children’s Ball! The Children’s Ball is an enchanting, evening soirée for children and their families to enjoy an extra special night out together. Guests can dress up in their fabulous, festive circus attire. Yes, you read right, The Children’s Ball is returning as a Circus! The Museum, which is known for its out-of-the-box ways of educating children with hands on, non-stop FUN, will be adorned with brightly colored balloons, circus games, characters and activities. Your tickets will include a hearty buffet dinner, special performances, plenty of awesome take home goodies and a special night that will live in your child’s memories forever. Don’t fret; the adults were also kept in mind when planning this spectacular night. Adults will be able to take advantage of a cash bar and a few lavish live auctions. Tickets to the event will cost $35 for parents and $50 for children. Tickets are available now for purchase online at ChildrensMuseumTC.org and will close once sold out. Sponsorship opportunities are available from $500 – $10,000 and include awesome perks like reserved seats, a possible limo ride and even the ability to sponsor another “Family in need of fun” to attend. Contact the Museum for more information at 772-225-7575 x203.